What Do You Need to Know about Vinyl Fence Gates in Dallas? A Dallas vinyl fence is a great way to keep the outside world out of your backyard, but what do you do when you need to get to the other side? A vinyl fence gate is an important part of every vinyl fence. That said, it isn’t always easy to choose the right gate for your needs. Here are a few questions to ask yourself when deciding on what kind of gate you want for your Dallas vinyl fence. How Big Do I Need My Gate to Be? Before deciding anything else about your vinyl fence gate, you need to know approximately how big it should be. Vinyl fence gates are available in a huge variety of sizes, from very narrow to wider than a two-car driveway. The placement of the gate, though, will affect the construction of the rest of your vinyl fence. Placing gates after the fact is much more difficult than planning ahead and knowing where your gate will be from the start. Most walk-through gates are three or four feet wide, about the same width as an interior door in your house. That said, it’s easy to get a gate that is wider or narrower depending on your preference. It can also help to think about what your primary purpose for your gate will be. What Will I Use My Gate For? To help you choose how wide you want your vinyl fence gate to be and where you want to place it, think about what you will use it for and if you need it to meet any special needs. For instance, you may need a wider gate close to the street if you have a backyard garage. A pool gate needs to be low enough that you can easily reach over it to lock and unlock it. A gate on a large property might need to be wider to accommodate riding lawnmowers or recreational vehicles. Remember to think about occasional or uncommon gate uses as well. You might not need to push a wheelbarrow through your vinyl fence gate very often, but you’ll be thankful it’s wide enough if you ever do. A good rule of thumb is to go a foot or two wider than the widest piece of equipment you regularly use (such as a lawnmower, four wheeler, garden cart, etc). This will give you some extra room to grow in the future. What Do I Want My Gate to Look Like? Vinyl fence gates come in a huge variety of styles, and our gates at Future Outdoors are no exception. Along with matching the look of your vinyl fence, you can also get a gate with an accent or additional feature to make it stand out. Here are a few popular vinyl fence gate additions you might want to consider. Accented Tops – This is a popular choice for people installing vinyl privacy fence with accents. The accented top on the gate can be built to match or to compliment the accent on the fence. You can also get an accented gate to add visual appeal to a fence without accented panels. Windowed and Peek-Through Gates – Many gates have small inset windows or peek-through areas that give you some visibility to the other side of the gate without compromising security or the structure of the fence. We can even build peek-through sections at custom heights and sizes to suit your needs and style. Some customers even build second windows low enough for pets to see through without escaping. Latch style – Depending on the type and use of your gate, you might want a latch or lock you can access from either side. Or perhaps you’d be happier with a lock you can only open from inside the fence. Either way, you can get what you’re looking for with a vinyl fence gate. Color – Some vinyl fence owners choose to make their gates a different color than the rest of their fence for additional visual appeal. Our vinyl fences at Future Outdoors come in a wide range of colors, so you’ll have plenty of options when choosing the look of your vinyl fence gate. What Should My Gate Be Made Of? For most fences and fence gates, vinyl is the perfect material. It’s strength allows it to withstand years of use and weather. It’s light weight makes it easy to open and close, and it also reduces stress on the fence posts and hinges. And vinyl’s durability means your fence gate will stay looking brand-new year after year. Plus, we build our vinyl fence gates with a powder-coated and painted steel frame to ensure they never fall out of square or break down. That said, we also understand that in some applications you need something other than vinyl. For example, if you’re looking for a sliding security gate for your home or business, you might need it to be made of metal rather than vinyl. At Future Outdoors, we can install gates made of steel, ornamental iron, aluminum, and other materials so we can always meet your fencing needs. Do I Want My Gate to be Manual or Automatic? If you’re installing a larger gate or a gate across your driveway, you might be thinking about getting an automatic gate rather than one you need to open and shut yourself. Automatic gates have a number of advantages, but they aren’t for everyone. To decide whether you need an automatic gate or not, think about how often you will be using your vinyl fence gate and what kind of use it will be. For instance, if you’re going to be driving through it every day, automation is a good option. However, if you only plan on driving through your gate occasionally, you might not need an automatic opener. If you do want automation for sure, you should also decide between solar and installed electric power. Solar power works well for most gates and is environmentally friendly. Since it’s self-contained, it also can be installed far from your house without any utility work. However, electric power is more reliable and may be a better option for gates installed in areas that are frequently shaded or dark. 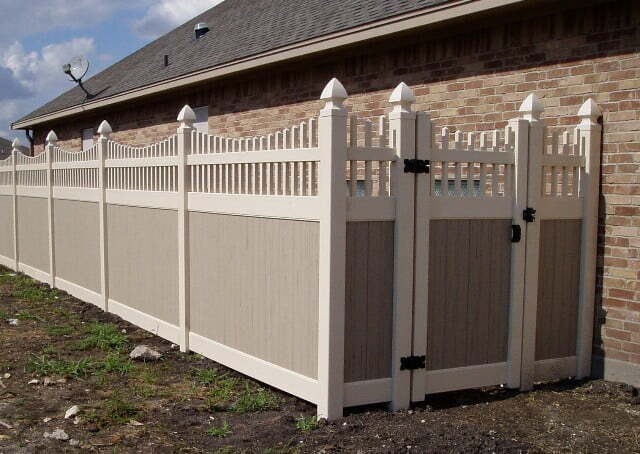 Do you have questions about your vinyl fence gate project in Dallas? Call (972) 576-1600 today to speak to one of our vinyl fence specialists here at Future Outdoors. As the leading provider of vinyl fence and vinyl structures in the Dallas metro, we have the experience and knowledge to answer all of your questions with ease. Call today or visit our website, or follow us on Facebook and Google+ for more updates and helpful tips.